The book is 358 pages. It is available in print in black and white. $25. It is also available as an eBook in color (iPad and Kindle formats). $15. Feel free to use any of these images below. The cover image for Backdoor Revolution. This is doorway of a garage conversion ADU in North Portland. This ADU was featured on the 2017 ADU Tour. We took several hundred photos of this door in different lighting and angles before getting just the right image. This is just a sample of those that did not make the cut. 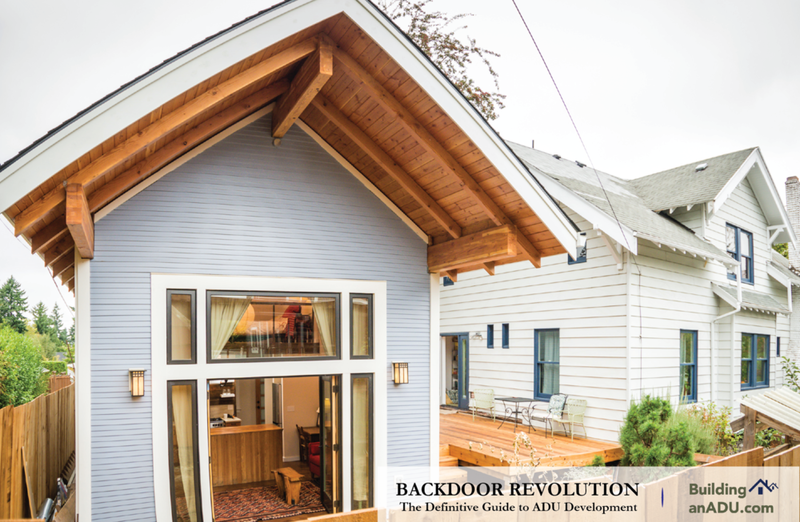 Backdoor Revolution is a practical guide to ADU development, such as the ADU featured here. It is also a book that explains some of the reasons behind the astronomical growth that ADUs will experience in many US cities in the coming years, depicted by the exponential growth curve in this image. An attached bump out ADU that was on the spring, 2015 ADU Tour. A long sight line from the lofted bedroom of an ADU that was featured on the fall, 2015 ADU Tour. A charming victorian home with a basement ADU, whose entry is discretely tucked away on the right side of the house. An attic conversion inlaw suite. Pacifica, a tiny house on wheels, located at Caravan- The Tiny House Hotel. Tiny houses on wheels are not ADUs, but have helped propel interest in small housing options. An above-the-garage ADU featured on the fall, 2016 ADU Tour. A detached new construction ADU with a modern cantilevered eave, shown behind the primary house. This ADU was featured on the fall, 2015 ADU Tour. 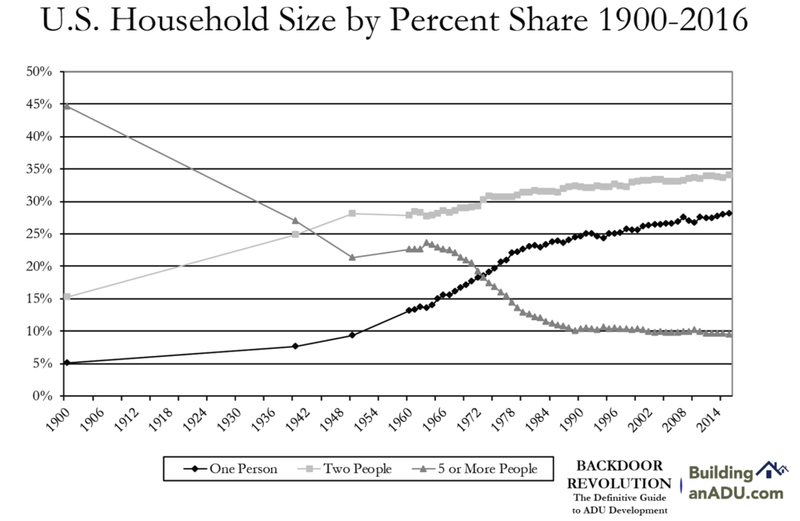 US household sizes have been shrinking for a century. Backdoor Revolution explains some of the factors that have contributed to this trend, and which create a pronounced need for more small housing units in urban areas. One person households are a growing portion of the households in urbanized areas. The black areas shown in the pie charts below represent the share of one-person households in each of these major US cities. Single family home sizes in the US have increased dramatically since 1950. Since the 1950s, shrinking household sizes and the growing size of residential structures has resulted in dramatic increases of per capita residential footprints. Most US cities are dominated by single family houses. These types of homes no longer match the demographics of US Cities. Backdoor Revolution explains how much ADUs cost to develop and some of the factors involved in those costs. Financing ADUs is challenging for homeowners. Homeowners tend to use a patchwork of different funding mechanisms to overcome the daunting capital barrier of ADU development. Portland has been a pioneering US city in ADU development. ADU development has increased exponentially since 2010. 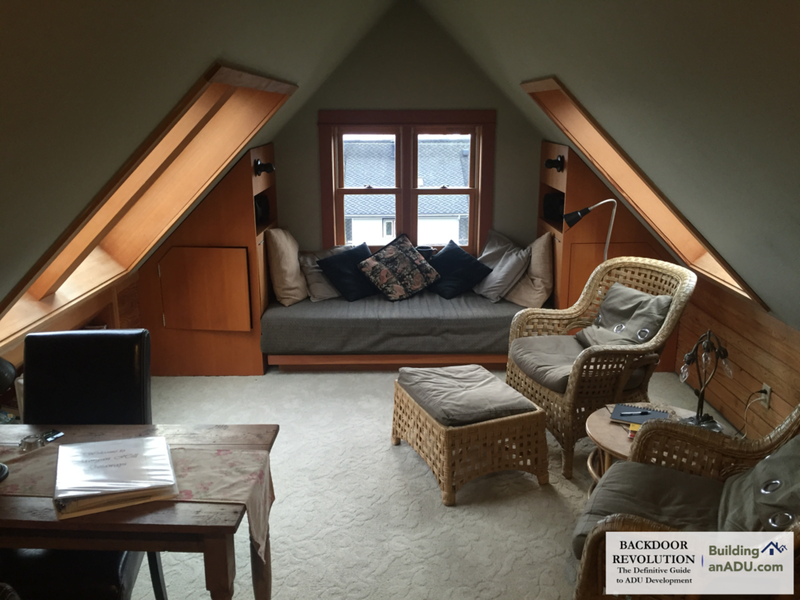 Backdoor Revolution provides a prescriptionto help cities increase the adoption of permitted ADUs. Backdoor Revolution” is dense with info, probably more than you’ve ever wanted to know about ADUs. Yet, at the same time, it is very readable and accessible. In fact, the first time I opened it, I sat down on a weekend morning with a cup of coffee, and before I knew it, I was through over 175 pages! If you have interest in this topic, it is an absorbing read. Backdoor Revolution-The Definitive Guide to ADU Development, is the most substantial written work about accessory dwelling units to date. Who is the audience? What will readers get out of it? Backdoor Revolution is written for two distinct audiences by design. This first half of book will serve as an in-depth, detailed guide to the process of designing and building an ADU for homeowners who aspire to build ADUs. It covers costs, financing, permitting, ADU design, rental models, step-by-step guidance, and more. It is written primarily for homeowners who want to develop an ADU on their property. The 2nd half of the book was written for planners & ADU advocates. It explores institutional barriers that have kept ADUs from taking off in most US cities till now. It provides case studies and a synthesis of research about ADUs. It will help city planners and ADU advocates to increase the number of ADUs in their jurisdiction. ADUs are currently a rare housing form, and it was important to get both professional readers (ie. city planners, advocates) and homeowner developers on the same page by covering different aspects of ADU development under one cover. Why do you think ADUs are going to become popular now? ADUs are going to become very mainstream in the next 2-5 years in major US cities. Though ADUs have been around for quite some time, recent CA state legislation has helped popularize them. As the ‘missing middle housing’ concept is popularized among planners and designers, ADUs are poised to present the most viable stepping-stone solution for cities that are experiencing a housing crisis, and exploring how to increase housing opportunities within their single family residential zones. The tiny house movement has popularized small housing since around 2013, and this popularity also contributes to the consumer interest and appetite for ADUs. These factors are converging to create a major ADU wave that will sweep across many cities in the country, starting with California, but ultimately spreading quickly to many major cities in the US, including in Colorado, New England, North Carolina, and the DC Metro area. What are some special design considerations for ADUs? ADUs are always accessory to a primary house. They're commonly urban infill. And, they're small and oftentimes bound by tight setback and height limitations. Those three features make ADU design specialized, and arguably more challenging than designing a conventional larger home. There is overlap with tiny house design, boat design, and small house design generally, but many of the concepts are intrinsic solely to ADU design. Backdoor Revolution has a chapter with 32 ADU-specific pieces of design advice. For example, one concept that is often overlooked by those who wish to build an ADU is the need for long term storage: both interior and exterior. While it is convenient to simply not add in extra storage because it can take up precious square footage, it is critical to do so. Those who do not have sufficient storage ultimately regret it. Bear in mind that instead of a single household on a given property, there may now be two. Both households need to store bikes, canoes, luggage and other seasonal items. If the garage is going to be converted to ADU, the owners should consider adding a shed. It may make sense to incorporate the shed into the site plan for the ADU, to ensure that there is good flow on the property. If the shed is going to have a concrete foundation, then it would make sense to take care of the excavation and concrete work at the same time as the ADU. This will cost more, so the homeowner will need to apply for a slightly larger loan. Building an ADU requires thinking three steps ahead. Backdoor Revolution will get homeowners thinking five steps ahead. This kind of advanced planning can really pay off, but it's impossible to plan like this without knowing what you're getting into. Where does the name Backdoor Revolution come from? Backdoor is actually a triple entendre. Backdoor could be understood as a colloquial synonym for ADU entrances, since ADUs are designed to be architectually accessory to the primary house. Backdoor is a software development technology term-of-art that refers to an application coding loophole that enables knowledgeable hackers to exploit a piece of software. Similarly, ADUs can be understood as a zoning code hack of single family residential zoning regulations, that knowledgable homeowner developers can utilize. This book equips homeowners with the skills to become these ADU developers. Backdoor implies an indirect approach to something. The ADU movement is a grassroots housing revolution consisting of both informal and permitted ADUs. The ADU movement has already been percolating for decades, mostly in the form of informal ADUs. These informal ADUs have generally been developed under the radar, without permits, developed through the backdoor, so to speak. This book brings this informal housing phemonoma to light and contextualizes it. Permitted ADUs that are developed through the figurative 'front door' are what is actually new-unpermitted ADUs have been popular for decades. Permitted ADUs will become a significant new housing trend in many major US cities in the next few years as more cities embrace more flexible regulations.